If you are in need of Air Conditioning & Heating Services you will find that Competition HVAC is a family owned and operated company and we complete HVAC and Refrigeration solutions by highly trained technicians. Our services include design, installation and maintenance for all types of Air Conditioning & Heating Systems in the Vancouver BC, Lower Mainland area. HVAC means: heating, ventilating, and air conditioning. HVAC can be defined as the technology of indoor and vehicular environmental comfort. Systems are designed to provide thermal comfort and proper indoor air quality. Air Conditioning and Heating system design is a sub discipline of mechanical engineering. These systems work on the principles of Heat transfer, thermodynamics and fluid mechanics. Air Conditioning & Heating is a creature comfort that we have come to expect at home and in the workplace. Behind the scenes the design and maintenance of both large and small systems requires a lot of skill and training. Training must coincide with the desire to give the end user a System that works and provide years of comfort. Keeping your process equipment and cold storage at the right temperature is a main goal. We also ensure fail-safe redundancy for your coolers, freezers, drive stations and controller rooms prevents expensive down time and production delays. We sell and service all types of Heating and Refrigeration systems. If your needs require custom design we will custom engineer, and install systems that will satisfy your needs. Our team is familiar with working in all types of Industrial environments and our maintenance programs are second to none for fast reliable, affordable long term maintenance. We understand process equipment and how important it is to keep cold storage at the right temperature to ensure fail-safe redundancy for your freezers, coolers, drive stations and controller rooms. Proper installation and maintenance of these environments will prevent expensive down time and production delays. Our mechanics are Red Seal ticketed, we maintain all types building systems to the highest standards of operational quality. We install, service and sell, Refrigeration systems for all types of commercial and retail environments. We are very experienced with Heat Pump systems and all types of Air Conditioning and Heating Systems. 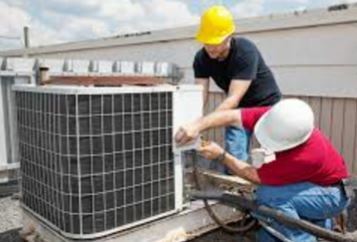 Competition HVAC will also handle all cooler, freezer applications in addition to air compressor servicing, generator servicing, air driers, and more. Safety is always paramount in a demolition site environment and safety always come first. Our trained team has all the equipment and expertise decommission your HVAC and Refrigeration systems. We are experts at reclaiming refrigerant from any system this allows you to legally remove and dismantle your system for salvage purposes. Competition HVAC will completely remove the units from from your location and even break them down into metal groups for easy scrap salvage. Our efficiency will keep you budget on track and the deadlines will be on target. An HVAC system design is only as good as its plan to keep it efficient over a long period of time. On-going neglect, poor decisions on replacement parts and misunderstanding of HVAC systems will compromise all the finer points of a good HVAC design. Efficient operations and maintenance practices may improve efficiency by as much as 20%. This efficiency target will not compromise creature comforts of the building inhabitants. System targets should be to continue providing thermal comfort at the energy use stated in the HVAC design of the complex. System performance could be improved to exceed original design specs. Listen to Noah about his unique Maintenance program. Go here for more information on the science of Air Conditioning. Call us today for all your HVAC, Air Conditioning & Heating needs. We are well known for our fast & Reliable service.